According to some economists, trade in finished products—the things consumers actually buy, such as cars, computers and iPods—declined by much less than 12.2% last year. That is because as much as two-thirds of the value of goods that go into trade statistics represent intermediate parts, which are imported from other countries and used to make finished products that then get re-exported. Economists call this the "valued-added effect." 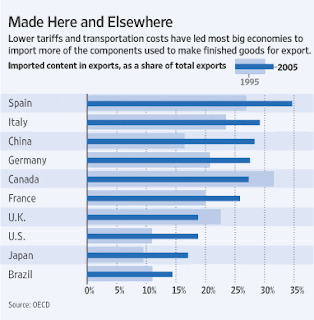 If the value of imported parts were stripped out, however, global trade would have declined by between 4% and around 8% last year, economists say. By ignoring the multinational composition of goods, conventional trade data also make trade imbalances between some trading partners seem larger than they really are. 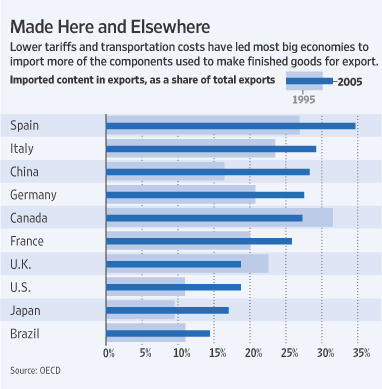 China imports a huge quantity of parts from places like Japan and South Korea, but when those components are assembled into finished goods and shipped to the U.S., all the pieces count as Chinese exports, inflating the U.S. trade imbalance with its most polarizing trade partner. A study by the Sloan Foundation in 2007, for example, found that only $4 of an iPod that costs $150 to produce is made in China, even though the final assembly and export occurs in China. The remaining $146 represents parts imported to China. If only the value added by manufacturers in China were counted, the real U.S.-China trade deficit would be as much as 30% lower than last year's gap of at $226.8 billion, according to a number of economists. At the same time, the U.S. trade deficit with Japan would have been 25% higher than the $44.8 billion reported last year, because many goods that China and others export to the U.S. contain parts purchased in Japan. The current method of calculating trade data is a headache for senior trade officials like Mr. Lamy. "It makes everything appear more volatile," he said recently in Brussels. "That creates a political problem." At a time of financial crisis, Mr. Lamy would prefer that politicians, civil servants and academics focus on finished products. Big swings in trade flows make commerce appear more volatile than it is, he says. Inflated trade deficits with China stoke fears in the U.S. about job losses. The latest round of global trade talks, which began in 2001, has stalled because of political fears about trade in the U.S., India and other countries. More than 100 members of Congress recently urged the administration of President Barack Obama to label China as a "currency manipulator." At recent Senate conference, Sen. Arlen Specter (D., Pa.) said that "we have lost 2.3 million jobs as a result of the trade imbalance with China between 2001 and 2007." Great graphic, huh? Anyway, the article goes on to say that, despite how misleading the current trade stats are, many economists believe that they're the best possible data. That may be true, and it's totally fine for economists to quibble about that and even to ultimately stay with the "old model" of tracking trade. From a purely political and/or policy perspective, however, it's a totally different story. The obvious fact that our current trade statistics really don't show what's going on out there - i.e., the actual effects of trade flows on nations, their exporters/importers, or their workers - should cause everyone to view the outraged assertions re: bilateral trade from protectionists like Arlen Specter with very serious skepticism. Better yet, just ignore them altogether. Because, as I've said many times now, today's protectionists are still playing Atari 2600, while the global economy's playing Wii (or PS3 or XBox 360 or... you get the idea).